Taken just after the blizzards last week. 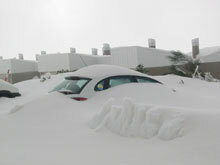 The snow was up to two metres deep in places. After a week of steady progress clearing 1-2m deep snow from the roads up the mountain to the observatories, LT workers were able to dig their way from the nearest stretch of clear road to the telescope yesterday and confirm that the circuit breakers had indeed tripped on 11th February. They have been reset and we now have power and comms to the LT again. The initial diagnosis looks good; the enclosure stood up very well to the blizzards with no snow/water ingress reported. We're now just waiting for the weather to clear, but the latest forecast is for conditions to worsen once more - oh well!